Contrary to popular opinion, Prohibition did not result in the establishment of organized crime. In fact, elements of organized crime had been present for decades before Prohibition was put into effect with the Volstead Act and the ratification of the Eighteenth Amendment to the U.S. Constitution in 1919 (set into effect in 1920). Prohibition did, however, have a solidifying influence, allowing organized crime to grow to the almost epic proportions which have been mythologized in American history, as, for example, is the case with figures like Al Capone and Eliot Ness. Such narratives are part not only of our national history, but of the unique history of the city of Chicago, one of the cities, if not the single city, most mired in a history of organized crime and gangster warfare. In many cases, the gangsters bought off whole waves of police and whole groups of politicians, forcing them to turn their heads to their illicit activities. The "law," then, seemed in many cases just as immoral as the gangsters they sided with. Government officials who were not corrupt often found they were powerless in combating the activities of the gangs of organized criminals. 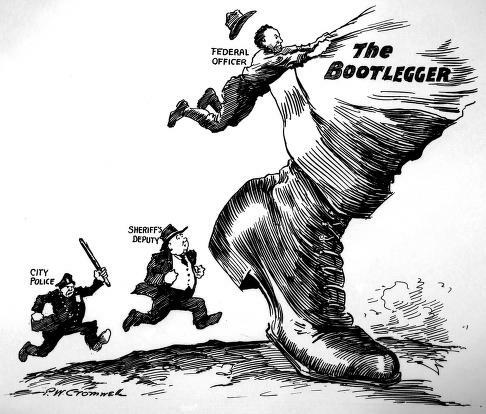 Bootlegging operations seemed unstoppable during the Prohibition Era (Bentley Historical Library). In many of the major literary works considering Chicago, the city takes on a connotation as an overtly corruptive influence, becoming the catalyst of numerous moral disruptions, a "devil on the shoulder" of many characters from Dreiser's Sister Carrie, to Wright's Bigger Thomas, to Algren's "disinherited" streetwalkers and hustlers. Considering the literature of Chicago provides numerous concrete examples of the corruption of law and politicians (Studs Lonigan as well as "Blight" by Stuart Dybek) as well as the fact that many normal people found themselves made into criminals through Prohibition (Studs Lonigan). In our web page, we seek to provide an exploration of the real corruption occurring in the city and its repercussions in thematic representations of the works. It is interesting to note that there seems a unique interplay of text and history here, which we seek to reveal; the literature of Chicago both seems to be informed by the historically-grounded "corruption of the city" in the gangsters as well as their friends in politics and in the police, while at the same time fictionalizing an aura of the city as a corrupting influence unto itself. In other words, the works we consider both form and are informed by Chicago's "corruption."